Its been a month since we first released Localscope on the AppStore and it has been an exhilarating experience. We’ve customer reviews from across the world - they’ve been positive and very encouraging, blog mentions and Apple love - yes, we got featured in the “New and Noteworthy” section through Christmas and New Year! David Chartier over at MacWorld thinks “Localscope puts local services at your fingertips by offering a choice in the services you search and wrapping everything up with a thick coat of style”. 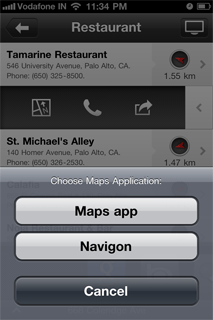 Christine Chan at AppAdvice recommends picking up Localscope, If you don’t have an app to help you find stuff nearby. Appolicious finds the user experience ‘Tasty’ saying the UI is slick and friendly, with a smart use of pulling and swiping. TheNextWeb and MakeUseOf loved the app and promoted it with a Giveaway each. And Spanish site MacVisions, calls Localscope a Google Places competitor. All the attention and good reviews have kept the excitement levels at Cynapse soaring high. But we aren’t just sitting back and enjoying all of it, instead we’ve been working on bigger plans and ideating on taking Localscope to the next level. Localscope is a mashup of social and local services enabling users to discover places around a location. While we aim to increase the choice of location search services and social networks integrated with Localscope, we realize that enabling users to do more with the results is equally important. Our customers too have been requesting for features on these lines. With this new release, Localscope seamlessly integrates with the multi award winning Navigon MobileNavigator GPS app for the iPhone. This means that users can find destinations with Localscope and be guided there using the amazing 3D panorama maps of Navigon MobileNavigator with voice guided turn by turn directions. Together, Navigon MobileNavigator and Localscope make the best location app combo out in the AppStore. Also new in this version, Localscope sets the default distance units as US or Metric automatically based on the user’s locale set on their iPhones, iPods or iPads. The new and updated version of Localscope is now globally available on the Apple AppStore, for US$2.99 (or the equivalent in other currencies). Visit the AppStore to get your copy now.